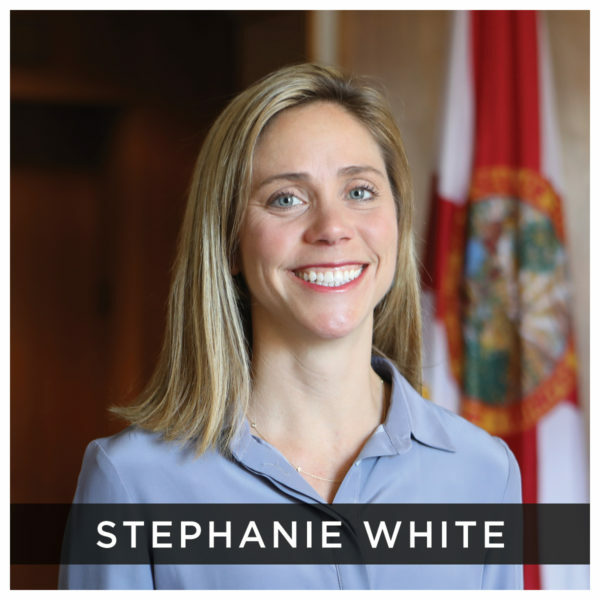 Stephanie Sansing White is an attorney in Pensacola, Florida where she focuses on adoption and child related issues, such as representing children in the foster care system. Previously she worked as the Community Affairs Director for the Sandy Sansing Dealerships. Before moving to Pensacola and starting with Sansing, Stephanie was an attorney in Dallas, where she represented abused and neglected children as the courts decided adoption, placement, and parental rights matters. She also served as a supervising attorney for the Children’s Advocacy Legal Clinic at the SMU Dedman School of Law and as a contract research attorney for Texas Lawyers for Children. Before practicing child advocacy law, she was a commercial litigator with Winstead Sechrest & Minick. Stephanie serves on the Board of Directors for Student Leadership University, Baptist Hospital Inc. of Pensacola, the Northwest Florida YMCA, Take Stock in Children Leadership Council, and World Help. She is a 7th Sunday School teacher at First Baptist Church of Pensacola. Stephanie is married to Frank, who is also an attorney and member of the Florida House of Representatives for District 2. They have three boys – seven year old twins, Henry and Clayton, and a five year old son, Wesley.